There were two key proposals made on Tuesday, as the Greece debt crisis worsens every day, and EU officials remain paralyzed. 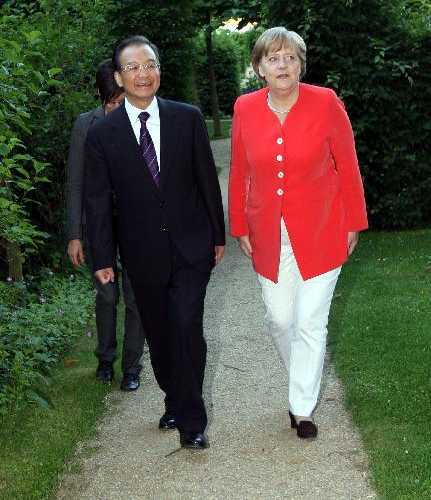 "China has expressed support for Europe at various times. In other words, when Europe is in difficulty we will extend a helping hand from afar. We will according to need definitely purchase certain amounts of sovereign debt"
He added that the problems of Greece and other euro countries are only of a "temporary nature." This is the same kind of pattern that the United States, as a creditor nation, followed in 1931, in bailing out Germany, a debtor nation. However, it did not prevent the collapse of Austria's Credit-Anstalt bank and Germany's Danatbank in 1931, which brought about massive unemployment, and social tension that gave rise to Communism and Naziism. This is all described in the 1932 book, "The bubble that broke the world." The Europeans, or at least the elder Europeans, are acutely aware of these 1931 bank failures and their consequences, which is why they're so much more panicked about what's going on than Americans are, and why they're so desperate for a solution. And that's why the Europeans are in a state of total paralysis. They agreed to the huge bailout package in May of last year, but they've done nothing but talk since then, even as it's become apparent that they're headed off a cliff and can't stop. Greece's immediate crisis deadline is coming very soon, according to Reuters. It has to roll over 2.4 billion euros of 6-month treasury bills on July 15 and 2.0 billion euros of 3-month bills a week later. In August, it has 5.9 billion euros of 5-year bonds maturing and must roll over 2.5 billion of bills. And things get much worse in 2012. Over the next couple of years, Greece will need something like 200 billion euros in loans. If anybody actually believed that a bailout of Greece would work, then they'd probably do it happily. It was obvious at the time of last year's bailout that it wouldn't work, but the politicians prayed for the famous, elusive "V-shaped recovery," and those prayers convinced enough people. But today, there's really almost no one left who believes in that fairy tale. Furthermore, as we described yesterday, the German people are turning firmly against any more bailouts of Greece. Get investors to share in the bailout costs, along with the taxpayers. This has been a longstanding demand of the Germans. Replace Greece's junk debt with equivalent AAA rated debt. Don't force investors to take any involuntary loss, since that would trigger a technical default, and would cause a chain reaction of credit default swap (CDS) payments that would cause other bankruptcies. In fact, don't let Greece default in any way, for the same reason. These objectives are inherently contradictory. If investors have to share in the bailout costs (the first condition), then they will never do so voluntarily (the third condition). It's a clear, unambiguous contradiction. One proposed solution is so-called Brady Bonds, which are explained by Wall Street Journal (Access). "As reported by European newspapers this morning, French banks had offered to reinvest 70% of their Greek sovereign debt holding maturating 2011-2014. The rest would expire. Of the 70%, 50pp would be rolled over into a 30-year bond, and the remaining 20pp would go into a zero-coupon AAA rated bond, possibly issued or guaranteed by the EFSF. The interest would be withheld and reinvested into a guarantee fund. Furthermore, banks could place the new 30-year bonds into a new Special Purpose Vehicle, thus removing Greek debts from their balance sheets. The French proposal is by far the most constructive step yet taken towards the resolution of the eurozone, but the talks are still in a preliminary phase. Many uncertainties prevail. For example, it is not clear yet whether the EFSF�s explicit mandate needs to be extended (though the scheme circumvents the need for secondary market purchases). Nor is clear how the rating agencies will react to such a scheme, as it constitutes an incentivised rollover. The German banking association and the German finance ministry expressed an interest in what is already being dubbed as the French model. Deutsche Bank seemed unconvinced, Reuters reports. The discussions were held in Rome at the level of the EFC, hosted by Vittorio Grilli." As Marx might say, this proposal contains the seeds of its own destruction. If the AAA bonds are ring-fenced in a "Special Purpose Vehicle," then the banks aren't guaranteeing them, and the only guarantees are those provided by the European taxpayer. And if the French banks were coerced into agreeing to this deal (which anyone in his right mind thinks they were), then the agreement wasn't voluntary, and the ratings agencies will declare a "credit event" default anyway. They've already made that clear in statements during the last few weeks. For more details about the proposal, see this summary by Reuters. Paralyzed euro officials have avoided making any hard decisions for months, and the crisis has gotten steadily worse. The French Model proposal is so nutty, it can only be described as an act of near desperation. During the next couple of days, Greece's parliament will vote on the package of austerity measures imposed by the EU in return for enough of a bailout to pay off Greece's bills through August. What will happen if Greece's parliament votes down the austerity measures? My guess is that the desperate Europeans will provide a bailout anyway, to "kick the can down the road." This will infuriate the German people in a way that can't be predicted. There's really very little time left. The French Model is not a solution, nor does any solution exist. Europeans will attempt further desperation can-kicking maneuvers, but the people, especially the German people, are impatient. It's quite possible that something major will happen this summer. Exactly the same kind of situation is happening in the United States. Washington politicians are in a similar state of paralysis as the Europeans. One would have thought that a compromise over raising the debt limit would have been found months ago, but the politicians are kicking the can down the road, and debating all kinds of proposals on television. According to the news stories, August 2 is either a hard deadline, or not a hard deadline. According to one Reuters columnist, there's a clause in the Constitution that would permit President Obama to ignore the debt limit, and just go on borrowing money. The U.S. is on the same path as Europe, though probably a year or so behind. Still, more and more people every day are coming to realize that America's debts cannot be repaid, any more than Greece's can, and that a default at some point cannot be avoided. China has been bailing out the United States by purchasing hundreds of billions of dollars of U.S. Treasuries, and is now saying that they might also bail out the Europeans. This is a fascinating and incredible echo of what happened in the early 1930s, and unfortunately will probably have an equally disastrous ending.